No machine? No problem. Revisit an old-school favorite to beef up your back development. Before they had any high-tech equipment at their disposal, bodybuilders lifted nearly anything they could get their hands on in the gym to make the muscular gains they wanted. One of their favorite and most utilized inventions was the T-bar row - minus the shiny coat of paint and soft chest pad. That’s right: State-of-the-art meant a barbell with a few plates on one side. Those visionaries were definitely on to something - this original move will add size and thickness to your middle back and lats just as effectively as any machine on the market today. And best of all, if you master it, you’ll not only have the kind of back you’ve always wanted but everyone in the gym will know that you’re cut from the same cloth as the great ones. Follow these steps and get it right. Straddle the bar near the plate-loaded side, with your feet spaced shoulder-width apart. Bend over and loop a close-grip handle securely under the bar, as close to the plates as possible, then grasp the handle with both hands. Keep your back arched and tight, your head in a neutral position and your knees slightly bent. This is your starting position. Keeping your abs tight, pull the bar toward your chest, squeezing your shoulder blades together at the top. Hold for a brief count, then slowly lower the bar along the same path until you feel a good stretch in your back muscles and your arms are near full extension. Stop just short of allowing the weight to touch the floor. Repeat for reps. Using standard 45-pound plates could limit your range of motion, so if possible, use smaller plates like 25s and 35s. To help prevent low-back injury, concentrate on drawing your navel in throughout the exercise, as well as maintaining the arch in your low back. Remain in the bent-over position throughout the exercise, allowing your chest to rise only slightly as you bring the bar upward. 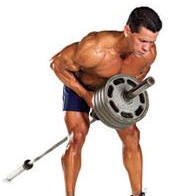 To better target the lower lats, keep your elbows close to your sides as you pull the bar up. Flaring your elbows decreases effectiveness.